Thank you for purchasing PDF Embedder Premium or Premium Secure! If you already have an existing (free) PDF Embedder plugin installed then you must Deactivate that before attempting to upload the premium version. 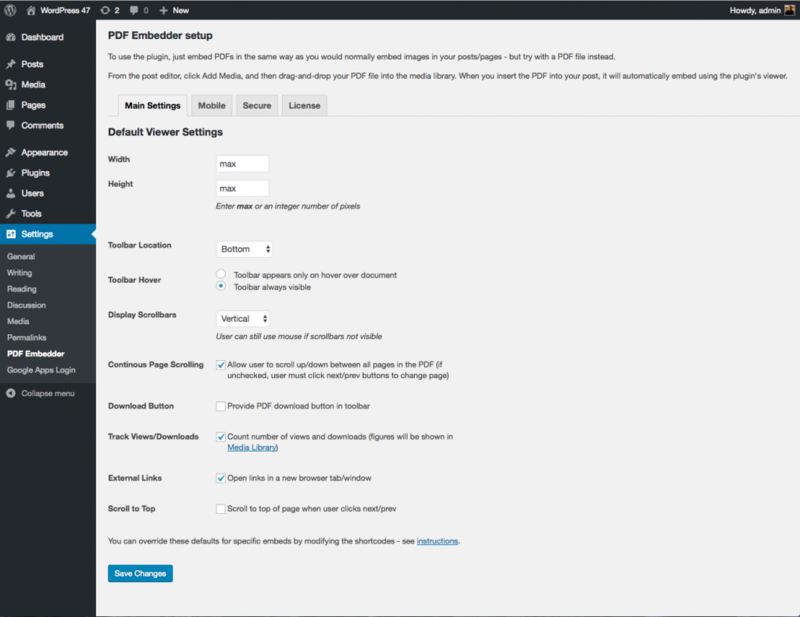 Inserting a PDF is as easy as uploading an image into a WordPress page. In your page/post editing screen, click 'Add Media'. Drag and drop your PDF anywhere into the media library and then click 'Insert into post'. When you publish the post or page, this should display as an embedded document viewer for your users to step through the PDF! You can change the shape and toolbar appearance of all embeds on your site (i.e. 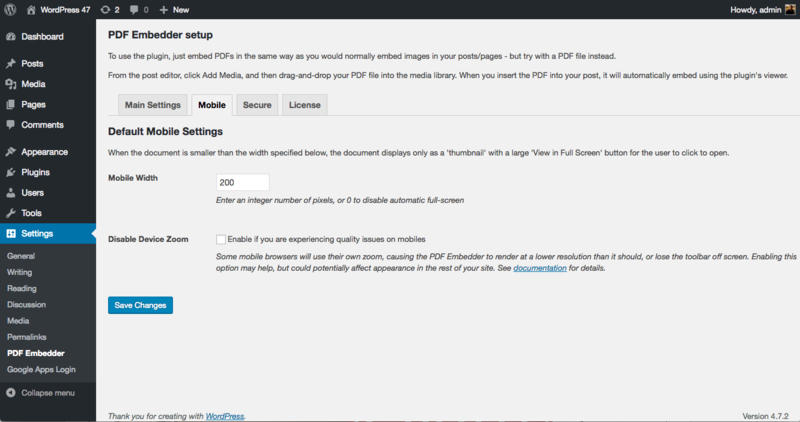 set site-wide defaults) through the page Settings -> PDF Embedder in your WordPress admin. Most settings there can also be overridden for individual embeds by adding parameters to the shortcode to configure how the document displays. Note the default value for width and height is 'max'. If width='max' the width will take as much space as possible within its parent container (e.g. column within your page). If width is a number (e.g. width='500') then it will display at that number of pixels wide. It is possible to specify a fixed height (e.g. height="200"), in which case the document may be cut off vertically. The height will be reduced to fit if it is larger than needed to display the document correctly. The global width and height settings can be overridden through the shortcode. Set whether the toolbar (containing next/prev buttons and page number etc) appears at the top or bottom of the embedded PDF, or both; or none to have no toolbar at all (default is 'bottom'). Can be overridden by 'toolbar' shortcode attribute. Select whether the toolbar should appear only on hover (or press on a touch device), or whether it should always be visible. Default is to appear on hover only. Can be overridden by 'toolbarfixed' shortcode attribute. Choose whether to display scrollbars - vertical, horizontal, or both - within the PDF embed; or none (default). Generally you don't need scrollbars because mouse movement can be used to pan around the PDF, and most browsers will display temporary scrollbars to move around the document when relevant. But you can choose to have permanent scrollbars, for example to make it more obvious to the user that there is more content on further pages. Can be overridden by 'scrollbar' shortcode attribute. Allows you to turn on or off the feature whereby the user can use the mouse/touch to scroll straight between all the pages of the PDF. Default is on. When 'off', the user must click the next/prev buttons to move to a different page. There is only a global setting for this option - there is no shortcode attribute to display some embeds with continuous page scrolling and some without. Choose whether to display a download button on the toolbar (default is 'on' for the regular premium version, 'off' for the secure version). Can be overridden by 'download' shortcode attribute. If checked then every time a PDF embed is viewed or downloaded, the plugin keeps a running total. These can be viewed by finding the PDF in the Media Library, and clicking once to open the attachment details. The download and view totals should be displayed on the right hand side column. There is only a global setting for this option - there is no shortcode attribute to track some embeds and not others. Links to external websites will open up in a new window if this option is checked, otherwise clicking the links will replace the current webpage, taking the user away from the site. Default is on. Can be overridden by 'newwindow' shortcode attribute. Scroll to top of page when user clicks next/prev, if this option is checked in Settings. Default is off. Can be overridden by 'scrolltotop' shortcode attribute. By default, if the embed area is narrower than 500 pixels, the document will appear as a thumbnail with a large 'View in Full Screen' button. This is designed especially for mobile devices where it can be difficult to interact with a small area, but the same 500-pixel logic applies on any web browser. You can change the cut-off width (or eliminate it entirely) by changing the Mobile Width setting: e.g. to 200, or 0 to always display the interactive document at any screen size. A 'Full Screen' button is always available on the toolbar, regardless. Can be overridden by 'mobilewidth' shortcode attribute. Default is off, but this can be checked to avoid conflicts when zooming on mobiles. Sometimes the browser will zoom the plugin's PDF viewer so you can't see the toolbar etc, and this setting may fix that problem as well quality issues. More details on problems on mobile devices are in the FAQ. If you are using the PDF Embedder Premium Secure version, you can find out more about the secure functionality here. We would very much like to hear from you with any questions or feedback at all. Please email contact@wp-pdf.com. There is also a knowledge base where you can find answers to common questions. There are also some extra shortcode attributes that you can use to change plugin functionality.